Louisville, KY, February 22, 2017 – The American Society of Agricultural and Biological Engineers (ASABE) presented their coveted AE50 awards for 2016 at the Ag Machinery Technology conference in Louisville. One of this year’s recipients of the award for Outstanding Agricultural Machinery Innovation was presented to Tribine Harvester, LLC of Newton, Kansas. 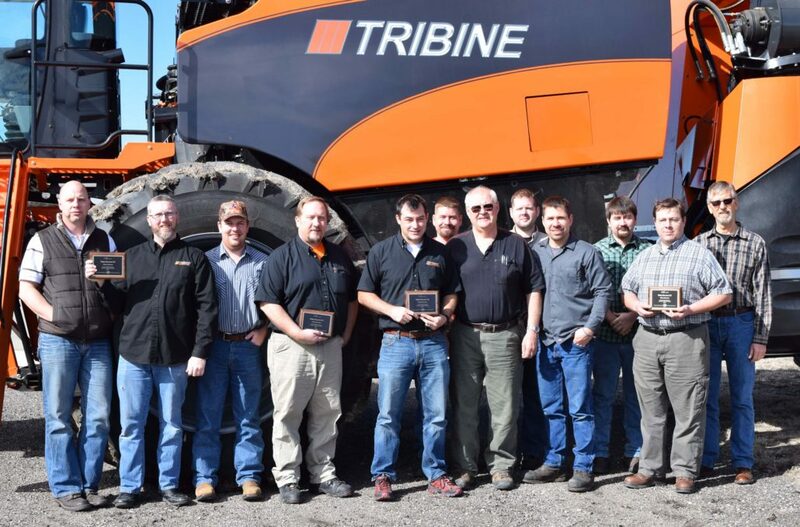 The Tribine Harvester was recognized for outstanding innovation in providing a quantum leap in grain harvesting technology, which promises to revolutionize harvesting rates and reinvent the grain handling aspect of modern high capacity harvesting systems and related agronomic capabilities. Accepting the award on behalf of Tribine Harvester was Bob Matousek, Tribine’s Vice President of Engineering. Matousek’s biggest task in the beginning was to assemble a suitably talented and experienced group of engineers that could make the Tribine a reality. It was decided that the group should be staffed in Kansas, and as an ironic turn of good luck the task was made considerably easier by the precipitous down turn in the Ag Equipment Industry, making good people available and willing to listen to an upstart like TRIBINE. The depth, diversity, and experience of the team allows a few good people to cover the vast field of knowledge that makes up a modern harvester machine. Very close ties to farming that exist in the group assure that the product will make sense to the operator, and increase profitability for the customer. Tribine Harvester moved into their new Newton, KS production facility in February 2016, with the first production unit rolling off the final assembly area in July of 2016. Designed and built in the USA the TRIBINE is the first fundamentally new “combine” to be introduced to the market since World War II. TRIBINE is a trademark of TRIBINE Industries. For additional information please visit the company’s web-site at: www.tribine.com, or contact us at (316) 282-8011 or email info@tribineharvester.com.